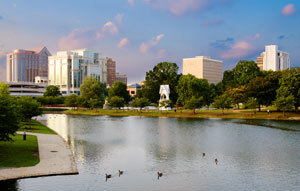 Huntsville is home to over 180,000 residents and is known as the “Rocket City”. There are many effective advertising opportunities throughout the city. One out-of-home advertising opportunity is in Madison Square Mall or in Parkway Place. Both of these shopping malls would allow you to target your audience. There are several highways servicing Huntsville which also provide an outdoor advertising possibility. Billboards on U.S. 72, U.S. 231, or U.S. 431 would generate high traffic exposure of your business. The many universities in Huntsville also create an environment full of competitive billboard prices. Zip Codes: 35801, 35802, 35803, 35804, 35805, 35806, 35807, 35808, 35809, 35810, 35811, 35812, 35813, 35814, 35815, 35816, 35824, 35893, 35894, 35895, 35896, 35897, 35898, 35899.